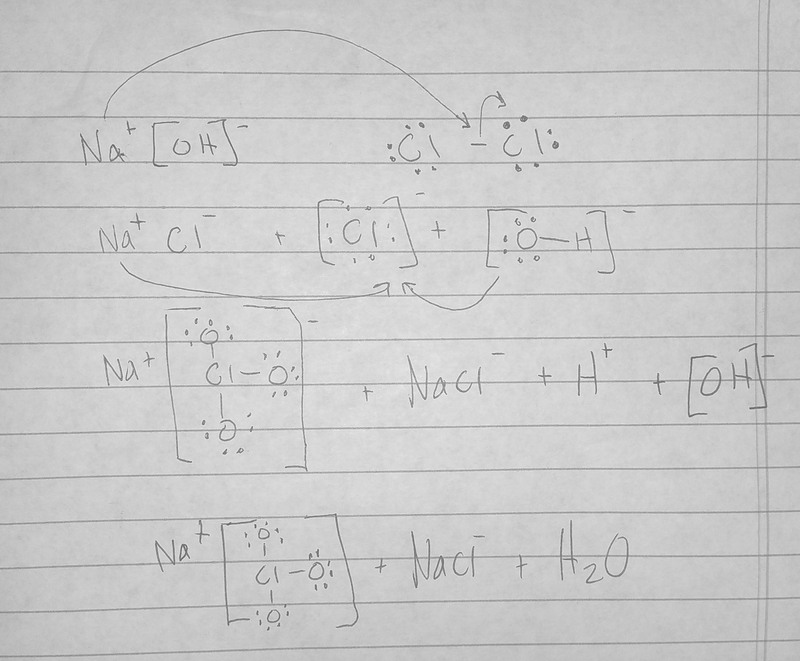 How do we get NaClO3 in the reaction between Cl2 and NaOH? In both reactions, there is twice as much sodium chloride as there is chlorine. How do the two additional oxygens connect to the chlorine? P.S. A related question - thanks, Nilay Gosh. I find that when I'm faced when problems having to do with why the products are formed I make lewis structures. Also notice that on the products side for every molecule of NaClO3 made there will be a molecule for NaCl made. From there you can speculate that when the Cl-Cl bond breaks three oxygen atoms and a sodium atom will surround one of the Cl while another is tied to a Na molecule simultaneously. What is the reaction between NaOH and urea? Why does the reaction between Na (s) and Cl2 (g) occur spontaneously if the entropy of the system decreases?